Experience Points: Are You Offended? So I finished Guacamelee! and I think I am supposed to feel offended. I remember being told I was a bad Mexican. To some of the white friends I hung out with, I was one of them. Once someone told me that because I played video games, read science fiction, and spoke with no accent, that I was whiter than they were. Now that was weird. Maybe I should have worn a sombrero or poncho around campus. Maybe then I would have been a Mexicano auténtico. To my extended family, my choppy spanish and awkward adolescence was a sign of my absolute assimilation into a destructive other. Claims to authenticity are poisonous. Within every mass, big or small, there are minorities and outliers. Yes, it can be important for minority communities to earn recognition as a whole, but efforts to homogenize are both futile and destructive. Those pushed out or excluded from communities for failing to adhere to behavior norms one way or another (this can include you too, even if you don’t know it), may have a hard time understanding what pieces of culture they can or cannot include in their personal identity. I grew up here in California and consider myself culturally Mexican and Chicano, but what this means is far more vague. I have created a self-identity that incorporates aspects of the already voluminous “Mexican culture”, just as you have undoubtedly formed an identity out of the diverse cultural influences you grew up around. A Mayan calendar hangs on my wall opposite a poster depicting the cover of Le Petit Prince (a french children’s novel everyone should read). I am multitudinous. Which brings me back to Guacamelee!, a metroidvania style platformer on PSN that offers a damn fun adventure with a few neat tweaks to the formula. The game is heavily inspired by Mexican popular mythos and iconography. 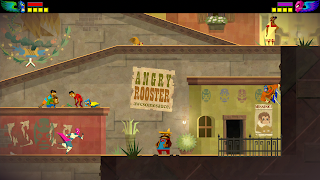 Mariachi music plays in the background, chickens roam about the town, the game’s skeletal dimension looks like a Dia de los Muertos diorama, and the protagonist is a brawny mask-wearing Luchador. 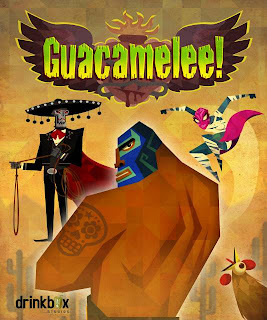 Without a doubt, Guacamelee! is charming. Yet while I enjoyed the game, I kept getting asked if I found the game offensive. Was I mad at the developers for creating a game set in a cultural landscape that, to the majority of the team, was foreign? Had they exploited my culture? Honestly, I don’t know. The concept of cultural ownership is strange to me. As far as I see it, the music of Mexico belongs to the world, as all music does. The sights, sounds, and festivities of the small pueblito where my family is from means something special to me. But if I took you there, drove you through farmland and forest, and walked you into the old stone church at the center of town or showed you the worn down arcade cabinet I played obsessively during my stays there, I believe you would fall in love. Culture is unique in that its shareable yet simultaneously subjective. With that in mind, the question is one of care. Does Guacamelee! celebrate or ridicule? When it comes to humor, it can actually be hard to tell. Juan Aguacate, the main character, has a comically terrible name (yes, aguacate means Avocado). His sidekick, Tostada, is no better. It’s tongue in cheek humor though, and the game is full of it. Many of the jokes, unless you are familiar with Spanish or even Mexican lore will be lost on you. Carlos Calaca, the undead villain, also has a pun name (Calaca means skeleton, mostly associated with figurines). The goat man, Huay Chivo, is a mythical beast in Mexican lore. For the most part, these references are worth a chuckle. On one hand, this is simple humor. Some characters are named after food, like the Hamburgler. It can make you smile, and that’s alright. On the other hand, some of the jokes seem to target Americans who find humor in Mexican caricatures with names from a Taco Bell order. In California at least, a common stereotype associates Mexican with food (a stereotype born of socio-economic conditions), which some may see mirrored in Guacamelee! 's many puns. X’tabay is a particularly strange inclusion in the game. The female villain, temporary lover to Calaca, is the first boss players face in the game. The foundational lore of X’tabay is rooted in the story of a succubus-like goddess or demon. While this mythology is particularly old, the figure of a traitorous and lustful woman has a long and sordid history in Mexican culture. Most notably, Malinche, a real woman who was blamed for many years for ultimate conquest of Mexico, remains a powerful icon that carries with it X’tabay’s connotations of sexism in Mexican culture. The cultural significance of Malinche is immense and deeply contested. Not surprisingly, Malinchista is still used as an insult against those who stray too far from Mexican culture. So here I am, a Malinchista, playing a game made in Canada, by a team mostly comprised of Canadians, laughing at a farcical luchador who gets his powers from a talking goat. I am certainly not against the idea of culturally diverse teams designing experiences that celebrate cultures not necessarily or entirely their own. Still, the game’s treatment of women, particularly considering gender politics in Mexican culture, I find more troubling. Am I offended? I don’t know. That’s the wrong question to ask. Reactions to cultural portrayals are deeply personal. We are better off asking what does the game do right? What does the game do wrong? And is the game made with care? Well written, Jorge. (And please read that as HOH-R-HEH at least for this post.) Always a pleasure to read your thoughts. I am an Argentine myself and sometimes cringe when I see depictions of Latin America or Argentina in American TV shows. I think my problem with references is when they are only skin-deep - funny names, stereotypical images, etc. Care is shown when the theme strikes at the core of the game, not just the palette and the background tunes. I haven't played Guacamelee yet, but I hope I do soon so I can ask myself these same questions. Thanks for sharing. Enjoyed this post. I'm Hispanic, but not Cuban, but have several Mexican-American friends who were discussing this issue, some who argued it was offensive and some who argued it wasn't... I'm interested to know, did people have similar issues with Grim Fandango? Just read your analysis on Kotaku website and I found it very compelling I guess stereotypes can work both ways and regardless of behavioral expectations or preconceived ideas I think your final statement hit the right spot, is this game good or not? is it entertaining?, how is the story? etc. Those are the questions we should be asking. The inclusion of X' ta bay was a nice surprise though, being myself from the south of Mexico this is a recurring character in our legends (like the "Llorona") and legend says she comes out from the Ceiba tree at the strike of midnight. Read you soon, now that I add you guys on my feedly!. ¡Cuídate y buen fin de semana!. Mira pendejo YO si soy mexicano viviendo orgullosamente en la Ciudad de México y como parte de los medios relacionados con la industria de los juegos de videos en mexico y VERDADERO MEXICANO puedo decirte que tu articulo no es mas que una sarta de berrinches estúpidos fomentados por la constante alimentación de racismo de la que sufres viviendo en el norte. La investigación, y dedicacion que el equipo de desarrollo en DrinkBox es un tributo a la amplia rica y colorida cultura mexicana de los ultimos 200 años desde leyendas antiguas hasta figuras contemporáneas. Just read this on kotaku, very well written. I'm a 1st generation Nigerian American and went through similar ridicule growing up in an inner city but loving video games. I completely understand how frustrating it can be to never see your culture represented in a medium you love, and then when it finally is, it's a caricature. I feel as though something is only truly racist if the intent is to demean the people represented. 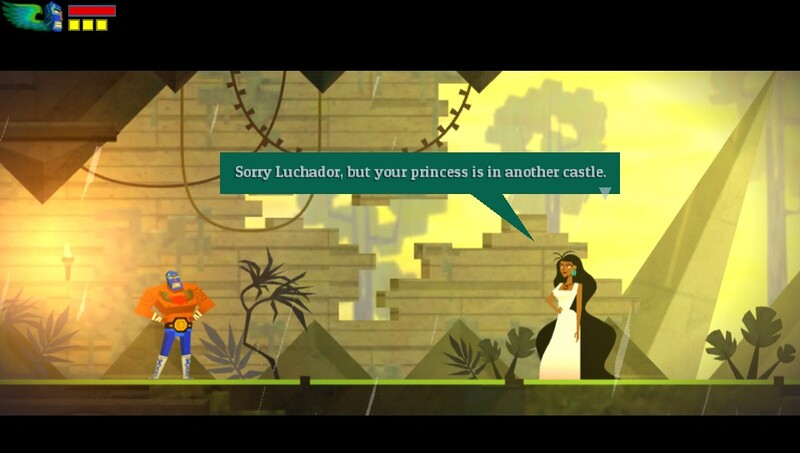 Though I've yet to play Guacamelee I don't think that was the intent. Not to say that total ignorance never hurt anybody, overall very interesting to think about. Anyway, I think that most Gringos are too afraid of being offensive (or "racists") that they end being more offensive that way. And (I think) they confuse "Being Racist" with "Stereotyping": to point out differences, "traits" of a group of people, that's a Stereotype. To believe that those differences make that group "inferior", that's Racism. To the point. I'm Mexican, too (100%), and while I haven't played Guacamelee (and unless they release this for 3DS, I probably won't play it in this decade), I can see it's full of "Mexican Folklore", like the Luchador Masks, the "Day of the Dead" references, the Mariachis and the "México is all desert" tropes. I'm not offended, but it's probably because I'm used to see México being always portrayed like that. Now it's just mildly "annoying" to see Flamenco hats instead of Charro hats (first picture in your article), people thinking that Cinco de Mayo is about México's Independence Day, and people thinking that the Aztec Calendar it's actually a Mayan Calendar. And, in a personal note, I hope that the "Mayan calendar" hanging on your wall is not actually an Aztec Calendar. Thanks David! I'm glad you enjoyed it. And I really hope you like Guacamelee. Despite the sensationalist headline, and probably some bad framing on my part, I do think that, for the most part, the Drinkbox game did an good job with the game. Moment of shame here, but I've never played Grim Fandango. That's an interesting question though. Thanks for stopping by and leaving your comment. I'm glad you picked up on my point, most people who read it were quite positive but some people got the wrong message that I was calling out Drinkbox for being racist (a term that never appears in the article). As for X'tabay, I was mixed no her. I love that the went into the lore with such depth, but I was still conflicted partially because of the continuing mythos of characters like her. I absolutely agree, I don't think the team intended for the game to be racist. It does have some major problems, but that doesn't mark the team with badge of shame by any means. For the most part, I enjoyed a game that seemed to celebrate Mexican culture, at least in relation to numerous other bland games in the industry. Hi Marco. Thanks for stopping by. Despite my better judgement, I did hop into the Kotaku comments section. There was some great conversations going on actually. Although some people got the wrong impression from my piece, or simply skipped reading it entirely. As for Guacamelee, yep, it's full of tropes. It isn't necessarily a bad thing and a lot of it works, but I could see how a barrage of stereotypes like that can grow tiresome. As for the Calendar, it is in fact a Mayan calendar. Funnily enough, it was a gift from someone who likely didn't know the difference. Thankfully, as I hope I make clear in my post, anyone can appreciate beautiful cultural works. I do have an Aztec calendar, but it's not hanging opposite the Little Prince. Writing that it was in my storage closet was a little less effective. ...Wait, what? You need to, Jorge! It's only one of top 5 games of all time. There's an exact phrase that describes what is making you uncomfortable here, it's called cultural appropriation. At least one of the developmental team was of Mexican heritage and aimed to create a game that celebrated their culture. Just so you know. Well, not exactly. I'm not specifically against appropriation per se. Even one's own cultural group can portray tenets of that culture offensively. I'm more interested in how any cultural representation is realized. Yep, I knew that going into the piece. In fact, there's a pretty funny video with one of their team members here: http://www.youtube.com/watch?feature=player_embedded&v=vQ4ILepqcnM. Again, I'm not asking for someone on the team to be Mexican as thought it would grant them free reign over what they make. I don't buy into the strict idea of cultural ownership. As I mentioned above, I'm more interested in how their work uses culture with some nuance.